Doom II RPG isn’t what you may be used to from the Doom franchise. id Software’s vision for bringing Doom to the iPhone isn’t the fast-paced action of former releases. 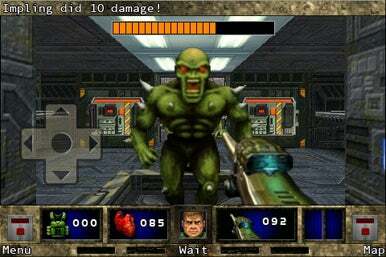 Instead of the normal "run-and-gun" mayhem, Doom II RPG is a turn-based role playing game with more emphasis on strategy and dungeon crawling than pure gunplay. You could A) move B) try talking to him C) shoot. Choose C.
The plot should be familiar by now: Scientists have unwittingly unleashed all sorts of beasts from hell and you need to not only survive, but dispatch the beasties before they ruin everyone's day. You're stranded on the moon and surrounded by the undead and other demons. But you'll have a full arsenal to dipatch the baddies, including your trusty shotgun, chainsaw, and uh, holy water squirt gun? Yeah, that’s right—a holy water squirt gun. Much like Wolfenstein RPG, Doom II RPG has more humor than horror. The game's plot may be doom and gloom but the characters' dialogue is often funny and the gameplay has moments of genuine satire. You play as one of three characters—a male Marine named "Sarge," a female Marine named "Major," or a scientist. Each character has different stats reflecting their different strengths and weaknesses. As you progress through the game and level up you can improve your base stats and unlock better gear and weapons. Doom II RPG has nine different hellspawn-infested levels to explore. Aside from just blasting demons back to hell, you’ll be looting corpses, solving puzzles and talking to people along the way. There’s plenty of cool and humorous weapons to use; for example, the aforementioned holy water pistol causes demon’s eyeballs to pop out. If you're a more traditional demon slayer, you can always opt for the chainsaw. You’ll also come across all kinds of useful items to heal you or give your stats a boost. Being a turn-based game means you’ll have to deploy some strategy to be successful. Taking an action such as moving or shooting takes a turn, then the enemies take their turn and the cycle repeats. Movement is handled with a d-pad for turning left or right and walking forward and backward. Strafing left or right is done by swiping a finger across the screen. To shoot you just tap on an enemy. Doom II RPG has old school graphics that fit the game well but certainly aren’t anything to write home about. If you liked Wolfenstein RPG you’re sure to enjoy this game as well. Doom II RPG may not be as intense as other entries in the Doom series, but it's a clever and intelligent app that is for the more discerning hellspawn slayer.